EPFO has recently introduced new EPF Composite Form F-11. A New EPF Composite Form will replace existing Form 11 and Form 13. Form 11 is declaration form currently used by a person taking up a new job in any establishment which is covered under EPF scheme. Form-13 is used to transfer your EPF or Pension from one account to another. The new Form will also address automatic EPF account transfer issue on the job change. Automatic transfer of PF account would be possible only if Aadhaar number seeding by the subscriber is completed. If Aadhaar seeding is not complete physical claim Form 13 will be used for transfer of account from the previous organization. This is as per latest EPF circular dated 20th Sept 2017. What EPF Composite Form F-11 contains? 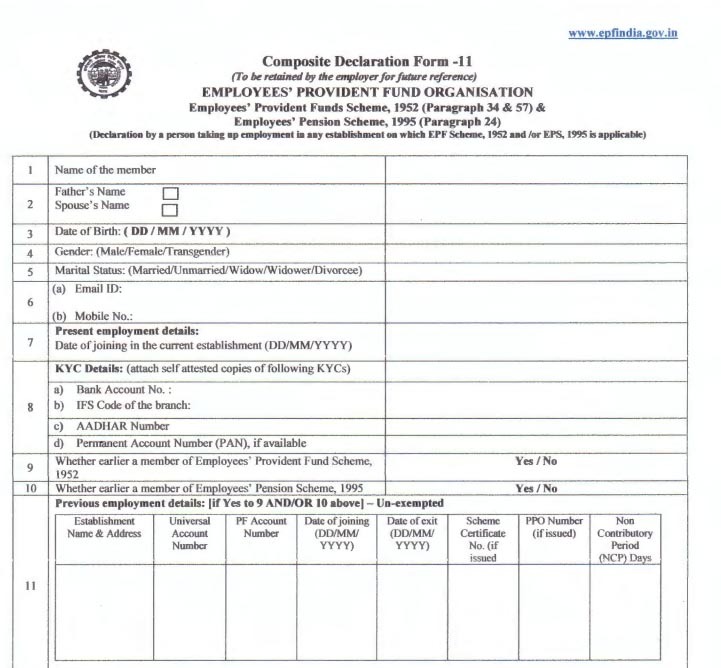 EPF composite Form F-11 contains personal information such as name, date of birth, gender, e-mail address, mobile number, present employment detail and KYC information. KYC section contains information about Bank account, IFS code of branch, Aadhaar Number and PAN number. A sample form screenshot of F-11 is given below. Name and address of previous establishment or trust is a newly introduced field in the new form. This field will be used by EPF office for the verification. In the earlier Form 11 these details were not included and hence form was sent to the previous employer. It seems intervention of the previous employer is removed in the entire process. When you change your job or join any organization you need to fill up Form F-11. Form F-11 is a declaration form submitted by you mentioning your status whether you are member or non-member of EPF in the earlier employment. This form contains your personal information and detail about your previous employer. Only Form F-11 is sufficient for automatic EPF account transfer in case of the job change. Form F-11 will be sent to EPF for automatic EPF account transfer. In case your UAN number and KYC details are not verified by the previous employer. Along with Form F-11 you also need to submit physical Form 13. Your application form F-11 along with Form 13 will be sent to your previous employer and other copy will be sent to provident fund. If you are frequently changing job and want to opt for new automatic EPF account transfer facility, you need to complete your KYC and Aaddhar Seeding at EPFO as early as possible. Form 11 can be downloaded from EPF website.